Chiggers and Humidity and Tractors… Oh, My! As we traveled through New Mexico, I had to admit that on a bus, one did get to see and experience places in a way that would not be possible by plane or even train, (although the old beat up Subaru I was planning to sell after this meltdown cruise was looking better and better all the time). In the midst of my in-motion terror, the welcome sign into one small New Mexico town did bring a smile to my face: “Portales, Home of 12,000 Nice People and 2 or 3 Grouches.” We left the State none to soon, however, for after spending only a few days in the Southwest and after buying my first cowboy hat, I had started speaking with a distinct twang. Now I know what got into Madonna after she moved to London. I had downloaded instructions to the home of Tim’s father, Bob and his wife, Frances in Arkansas from Mapquest. We called to let them know we’d be there the next afternoon. “Do you need directions?” Bob asked. “Nope,” Tim assured him, “Doreen got ‘em off the internet. Right to your door.” What we soon learned about Mapquest is that while it certainly provides the most direct route, the most direct route is not necessarily the most drivable one - especially for an oversized vehicle. Bob and Frances live in an unincorporated part of small town, Van Buren. The internet directions seemed easy enough. We got off the highway and started following the instructions. The roads kept getting smaller and smaller. Soon, we were traveling over tiny, one lane bridges perched precariously over creek beds. We passed a “No Trucks” sign. “We should turn back!” I exclaimed. “How many are we?” I cried, reeling with bus phobia. “Twenty,” he replied, “Don’t worry.” We made it over that bridge, only to quickly come to another, this time with the sign, “Limit 13 Tons.” That was all I needed to turn my reel into a full fledged centrifuge, as I felt my lunch separating itself from my intestinal tract. “WE’RE 20 TONS! WE’RE 20 TONS,” I screamed, grabbing the seat back to steady myself. That there are no armrests turns out to be a serious design flaw when the “buddy” seat is inhabited by a bus phobic. “Don’t worry,” Tim assured me, a manic gleam in his eye as he barreled onward, “It’s too small for us to have all three axels on at the same time.” He hit the gas and we sped to the other side. I don’t know which is worse: A bus phobic wife or her bus crazed driver husband. Finally, we came to an obstacle that would even have lent The Simpsons' Otto pause: a washed out culver. Tim stopped the bus, climbed down and inspected the impasse first hand. “I might agree,” Tim said, “but we still can’t turn around.” He was right. We were on a single lane road, with no room to park the Jeep, let alone turn the bus around. He got back behind the wheel and gingerly maneuvered us through the stream. When we finally made it to his father’s house, (I think I kissed the ground, but I can’t be sure… it’s all a blur) Bob and Frances had a good laugh when they heard how we came. “We won’t even drive our cars that way!” Bob exclaimed. 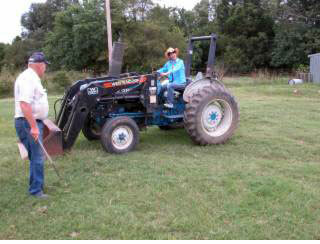 While we were on Bob’s farm, I asked to drive the tractor. I may not have been willing to get behind the wheel of our bus, as Tim thought I should, but at least I could attempt to partially counter my phobia by driving some type of big rig. When Bob showed me the clutch and the seven speed pattern with high and low differential, I turned to him and asked, “Don’t you have one with an automatic?” He looked at me as if calculating the increase in insurance premium I was about to cost him. But, wearing my new cowboy hat, jeans and pair of old cowboy boots left over from my days in Tucson, I drove the thing across his cow pasture and back, without injury to man or beast. I guess all it takes to drive a tractor is the right outfit. Arkansas in July. No wonder that upon hearing where we were going for our shakedown cruise, our friends shook their heads in disbelief. I was truly, more than ever, ready to call the home office and fire the bus driver. Buffalo Gnats, Chiggers, and my hair! Remember the Hindenburg Disaster? Oh, the humidity! It had been raining for the past week (the same rains that had washed out the narrow roads nearby) and parking in Bob and Frances’ front yard was probably not the brightest idea. We started sinking and by our second day there, were pitching distinctly starboard. Whenever Tim was in earshot, I couldn’t resist singing in my best falsetto, “Nearer My God to Thee,” alternating with an even more overwrought rendition than the original “My Heart Will Go On.” I still have a bruise on my chest from the climactic thumping part. Where’s Celine Dion when you need her? One morning, we were awoken by Frances banging on the bus door. “Tim! Tim!” She cried, “Come quick!” We both assumed something terrible had happened to Bob, but soon discovered that it was cousin JT, who lived down the road a piece, who needed help. While jump-starting his tractor that morning (and standing in front of it) he had gotten run over and was refusing to go to the hospital. Bob wanted Tim to go take a look at him. My first thought was, “OK. I guess my husband the psychiatrist can ask how JT feels about his near-death experience,” but before I could say anything, Tim had run out the door. During the four hours before he returned, it started to pour. Now, I could almost feel the bus getting bogged down. Would we ever be able to get out? Did the local AAA have a flatbed truck to rescue us with? Was there even a local AAA? Would the entire earth swallow us whole and if so, what would I do with the pets? I decided that with Tim AWOL, I was acting captain and would be forced to go down with the ship. The only thing to do, then, was huddle under the covers with Shula, contemplating our murky demise. As I turned off the bedroom lights (the better to cower with), I remembered the large extension cord plugging the bus in to an outside outlet, allowing us the electricity to run our air conditioning, appliances, etc. Might we be electrocuted before we were submerged? It seemed as if Sunnydale’s Hellmouth had opened a franchise in Van Buren, Arkansas, trying to reclaim a lost member to the fold – our very own hellbus. Unto every generation, a pathetic Princess who listens to her husband’s idiotic plan is born. Oh, Buffy. Where were you when I needed you? Cousin JT finally agreed to go to the hospital after Tim told him that in his medical opinion (he left out that he was a shrink), JT would die if he didn’t get proper care. Good thing, too: turns out he had two punctured lungs, four broken ribs and a broken clavicle. The muddy ground that was my nemesis turned out to be his savior, because if that tractor had run over him on dry land, he surely would not have survived. Bob showed us the correct, non-Mapquest way to leave for home in a few days, but unfortunately, there was construction, considerably narrowing the two lane road. It had Jersey barriers that I found… disturbing. “Are you sure we’ll fit?” I kept asking Tim, nervously. Yes, yes, he tried to reassure me. “Maybe we can get Bob and Frances to drive me to the airport,” I immediately shot back. One night, we drove a few miles to the cabin of Joanne and Jay Rainwater. There, most Wednesday evenings for the past ten years, Jay and his friend, Don Murphy, play blue grass music together. Jay, a distinguished 70 year old with a ready, knee slapping grin (unless he has an instrument in his hand, in which case he compensates for the lack of knee slapping with an even wider grin) plays guitar and mandolin. Don, a handsome, lanky man in his early 60s, plays guitar and banjo. We all sat out on the deck, with another neighbor couple and the Rainwater’s two year old Chihuahua, Troubles, running from one to another of us, begging for a lap. You might say Troubles seemed a bit troubled herself, since as soon as she got the lap she seemed to be craving, she’d decide there was better lap to be had, and insist on getting down. Tim and I each held her, many a time, knowing full well there’d be hell to pay when we got back to the bus, in the form of accusatory looks from our own animals when they figured out we’d been cheating on them. As we sat out on the deck, surrounded by tall, graceful trees, night fell and hummingbirds gave way to fireflies. We saw a deer and her fawn at the edge of the yard. Jay and Don would play a few tunes, then let their fingers rest while everyone chatted for a spell, then play some more. Don laughed at times while he played, presumably because he’d made a mistake, although I never caught one. As Bob told him, “If you didn’t grin, no one would know you’d hit the wrong note!” During one of their breaks, Don told of a cow he had with a muscle disease which caused it to stink real bad. Jay commented that he himself couldn’t tell, because he couldn’t smell: his nerves had been cut during a dental procedure. “But,” he went on with that ready grin, “there’s a guy at work who can’t taste or smell, so I figure I’m ahead of the game.” Don, we were told later, had been offered tidy sums of money for his banjo - up to $18,000 - but he refused to sell. It was over 80 years old and had the best tone of any he’d ever played. Unfortunately, we didn’t get to hear too much of that wonderful sound, as Don left early, for he had to be up at 3:30 am to make his shift at the manufacturing plant. As Tim and I talked later about how much we enjoyed the evening, he remarked that it was a throwback to a simpler time, when people depended on each other for entertainment, rather than technology. I wonder which is simpler, really; relying on TV for social glue, or on ourselves and each other, leaving it to our imaginations and talents to delight and ultimately bind us together. I'm getting such a kick out of reading of your adventures. Here at work, people are starting to wonder when they hear me "gafaa-ing" at your latest adventure. I'm also glad you are still providing clinical consultant services for MGL. This page contains a single entry from the blog posted on July 25, 2004 4:46 PM. The previous post in this blog was Leave the Driving to Zarcon. The next post in this blog is Gilligan's Remix.